Boobies belong to the family Sulidae, which also includes gannets. 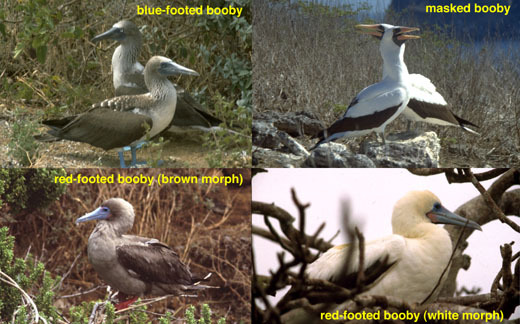 In the Galapagos, there are three boobies: the masked booby (Sula dactylatra), the red-footed booby (Sula sula) and the blue-footed booby (Sula nebouxii). 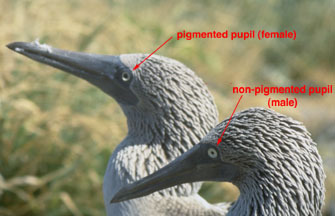 Despite the obvious color differences, the three boobies are very similar in body shape, with the masked being the largest and the blue-footed the smallest. Though small by comparison, the blue-footed booby has, proportionately, the largest tail of the three. All three have torpedo-like bodies with sharply pointed beaks. Indeed, the local Spanish name, "piquero" is derived from the beak shape: "piquero enmascarado" (masked booby), "piquero patas rojo" (red-footed booby), and "piquero patas azul" (blue-footed booby).The origin of the name booby is less clear, probably derived from Spanish "bobo", or clown, in reference to their habit of landing on ships at sea and being easily approached - and killed - by sailors. It is fairly easy to distinguish males from females by voice - males make an asthmatic whistling sound while females croak. Blue-footed boobies can also be distinguished because the females have a ring of dark pigment around their pupils, making them look bigger than those of the males. Red-footed boobies are dimorphic for plumage. About 95% of the birds have brown plumage while 5% have a white plumage very similar to that of the masked booby. It is curious that in red-footed booby populations in other parts of the world, the percentages are reversed, with the white morph being the more abundant They are, nevertheless, the same species and, if you are lucky, you can see a brown/white pair. All three birds have similar body shapes, and they lead similar lifestyles, but refrain from competing with one another because they fish in different areas. Blue-footed boobies tend to fish very close in to shore, masked boobies a bit farther out, and red-footed boobies fish well out at sea. The distributions of their fishing grounds influences the distribution of their nesting sites. Blue-footed boobies nest in the center and edges of the archipelago (Espanola, Daphne, and N. Seymour). 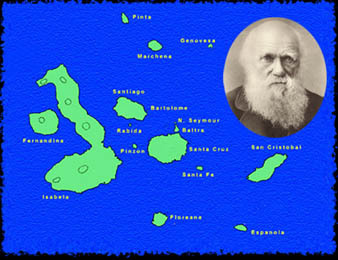 Similarly, masked boobies tend to nest at the edges of the archipelago (Daphne, Espanola, Genovesa), while red-footed boobies tend to be found only at the fringes of the archipelago (Genovesa and Punta Pitt on the northeaster tip of San Cristobal). Because of their distribution, it is typically the blue-footed booby that visitors tend to see fishing. There is another remarkable bird found here which has not before been described. It is called the diver. They resemble the small kind of booby, and something similar to the kind which is described at the Lobas Islands, called Bonaparte's army, excepting they are of rather a darker colour on the breast and neck, and their beaks and feet are of a prussion blue. These birds collect together in small flocks for the purpose of diving. They fly round in a circle and continue to rise till they get to the height of from sixty to a hunmdred yards in the air, when one of them makes a pitch to dive, at which motion everyone follows. They fly down with remarkable swiftness till within four or five yards of the surface, and then suddenly clasp their wings together and go into the water with the greatest velocity that can be conceived of, exceeding anything of the kind that I ever witnessed. This bird should be contrasted with the pelican. They go into the water with such force as to form a curve of thirty or forty yards in length, before coming to the top again, going to a great depth under water. They glide under water at almost as great a degree of swiftness as when flying in the air. The water was so very transparent where the ship lay, that they could plainly be seen during their submarine course. The plunge dive of the blue-footed booby is just as awe-inspiring today as when Delano described it nearly 200 years ago. Boobies and gannets, in general, have complex courtship rituals and in the Galapagos, the courtship of the blue-footed booby is most complex. The male attracts the female's attention by a behavior called sky pointing, in which he tips his beak, tail, and wing tips to the sky while letting out a whistle. The two then slowly march around each other, lifting their bright blue feet in a high, slow step. Finally, male and female sky point to each other. Both the masked and red-footed boobies engage in courtship displays, and both sky point, but their's is not nearly as elaborate as the blue-footed booby. Many members of the Sulidae build nests, but in the Galapagos, only the red-footed booby does. Both the blue-footed and the masked boobies nest on the ground, the blue-footed boobies often making a guano ring around the nest area. Nevertheless, as part of the courtship process, the male blue-footed booby offers the female a twig as part of a ritual nest. Both booby pareents help in rearing the chicks and take turns guarding the nest and incubating the eggs. Most birds, but not boobies, develop a brood patch on their belly during nesting season. This is a spot where the feathers are relatively thin and blood vessels in the bare skin keep the eggs warm. Boobies compensate for their missing brood patches by laying their feet over the eggs and the blood vessels in the webbing accomplish the same purpose. The three boobies have very different brooding patterns. The red-footed booby lays one egg and raises one chick. Likewise, the masked booby also rears one chick, but it approaches the problem differently. Masked boobies lay two eggs, several days apart and the older chick is much bigger than the younger. Assuming that the older chick survives, it will push its younger sibling out of the nest, where it will die -- all under the eyes of a seemingly uncaring parent. If the older chick dies, however, then the younger chick acts as a back-up. Blue-footed boobies, on the other hand, lay up to three eggs and, in a good year, can raise all three chicks. At least part of what makes this possible is that by fishing in very close to shore, blue-footed boobies parents can make more and frequent trips in for feeding. In lean years, however, the older chicks engage in siblicide.